From 1996 to 2005 they were one of three Australian teams competing in the Super 12 competition, alongside the New South Wales Waratahs and the ACT Brumbies. Queensland finished as minor premiers in 1996 and 1999. From 2006 to 2010, they competed in the expanded Super 14 competition as one of four Australian sides. Beginning in 2011, they are one of five Australian sides in the expanded and renamed Super Rugby, winning the competition in its first season in its new format. In 2012 they finished first in the Australian conference. The first recorded games of Rugby in Queensland were played in 1876, when the existing Brisbane Football Club (formed in 1866), switched to Rugby to align with the newly formed 'Rangers' and 'Bonnet Rouge' football clubs. However, it was reported that the game was soon varied to suit the preferences of the local players, and “rugby, with Brisbane variations, was the game played” (The Brisbane Courier, 10 July 1876). 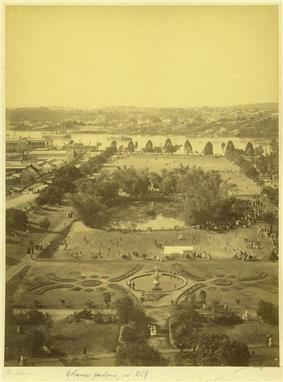 Most of these games were played at the Queen's Park (now part of the City Botanic Gardens (see image at right). However, the Brisbane Courier reported in 1879 that the Brisbane FC had reverted to what had become known as the 'Victorian rules', “in place of the Rugby Union Rules played by the club during the last three seasons”. In 1880, the club became a foundation member of the Queensland Football Association (QFA), along with Wallaroo, Excelsiors and Athenians (Ipswich), where it was decided to recognise and play mostly 'Victorian rules', with occasional games of 'Rugby' rules. However, in 1882, a Brisbane FC representative (Daniel Foley Pring Roberts) arranged a Rugby match against the Sydney Wallaroos Rugby club, after the NSWRU (Rugby Union) offered to pay all costs associated with the match. Brisbane advocates of the Victorian rules game reacted angrily and declared that no QFA player would be permitted to play under Rugby rules, which led to the formation of the Northern Rugby Union (now the Queensland Rugby Union) in late 1883. The defining moment in the code battle came with the 1886 Queensland [Rugby] side, who defeated NSW for the first time in Sydney. “The success of this team undoubtedly won the day for rugby game in Queensland. The Victorian game supporters were struggling hard to uphold the premier position they had gained but after the brilliant performance of the 1886 team, who lost only one match through their tour, the rugby game became very popular and the next season several new clubs were formed and the Victorian game began to wane” (QRU Annual, 1902). In 1883, the first inter-colonial match in Brisbane took place, with Queensland defeating New South Wales 12 to 11 at the Eagle Farm Racecourse. In 1896 the first Queensland team departed for a tour of New Zealand, where they played New Zealand at Athletic Park in Wellington on 15 August, losing 9 to nil. In 1899 Queensland recorded their first win against an international team, defeating Great Britain 11 to 3 at the Exhibition Ground (see team photo at right). The Queensland team remained a representative team selected solely from the rugby union clubs within the state, until the advent of the Super rugby competition in the 1990s. With the start up of rugby league as well as World War I, Queensland rugby was dormant for a number of years, and the QRU was disbanded in 1919 and was not be revived until the late 1920s. In 1928 the QRU was re-formed, and the GPS competition and major clubs soon returned. The game struggled during World War II, but growth was nonetheless apparent, with the advent of the Queensland Junior Rugby Union and the Country Rugby Union. In 1950 the QRU secured the Normanby Oval at nominal rent from Brisbane Grammar School, before they moved into Ballymore Stadium in 1966, which would serve as the spiritual home of Queensland. In 1980 Queensland defeated the All Blacks, which was their first win against New Zealand. The match was played at Ballymore on 6 July and Queensland won 9 to 3. Two seasons later centenary celebrations took place, with Queensland defeating New South Wales 41 to 7 in the celebratory match. The first Super 10 was held in 1993. Queensland were grouped in Pool A alongside Auckland, Natal, Western Samoa and Otago. Queensland finished with five points, in fourth place. The subsequent Super 10 competition of 1994 saw Queensland finish at the top of Pool A on 13 points, edging out North Harbour on for and against differential to finish at the top. The Queensland Reds went on to play the winner of Pool B, South African side, Natal. The Reds won the final, 21 points to 10 at Kings Park Stadium in Durban. The following season was even more successful for the Reds, who were playing in Pool B for the 1995 season. They finished the season with 16 points, four points clear of second placed team in their pool, the Free State. South African team Transvaal had finished at the top of Pool A and the final was to be decided at Ellis Park in Johannesburg. Queensland won the final 30–16, and thus became back-to-back champions. With rugby union going professional, there was a reworking of competitions. The SANZAR partnership was formed between the New Zealand Rugby Football Union (NZRFU), the South African Rugby Football Union (SARFU) and the Australian Rugby Union (ARU) and the Super 12 was born. In the 1996 season Queensland finished at the top of the table. Queensland hosted their Super 12 semi-final on 18 May 1996. The game was played at Queensland's home of rugby union, Ballymore, and was played against the Natal Sharks. The Sharks defeated Queensland 43–25. The 1997 season saw the Reds finish in ninth place. In 1998 the Reds had a much better season, finishing in fifth position at the end of the season. In 1999 Queensland lost only three games during the regular season, and finished at the top of the ladder on 36 points (beating the Stormers to first position due to for and against points). The Reds hosted the Canterbury Crusaders at Ballymore for a semi-final. Canterbury won 28–22. In 2000 the Reds finished in seventh place on the ladder. In 2001 the Reds finished in fourth place on the ladder and played in the semis. They played fellow Australian team, the Brumbies in Canberra, and the Brumbies won 30 points to six. The following season, 2002, the Reds finished in fifth place. For the 2003 season, Queensland finished in eighth place. Queensland finished tenth in the 2004 and 2005 Super 12 seasons. In 2006, the Super 12 became the Super 14 with the addition of the Western Force (AUS) and the Central Cheetahs (RSA). Queensland played the Waratahs in the opening game of the season, which was a close loss. The Reds also played new team the Western Force, which Queensland won. Queensland finished 12th on the ladder. Former Wallabies coach Eddie Jones took over from Jeff Miller as coach for the 2007 season. New coach Eddie Jones got off to a winning start at Queensland Rugby, with a Queensland XV, 63–22 victory over the NEC club. The Reds took part in the one-off Australian Provincial Championship not getting the start they wanted, losing to the Force 32–6 at home in round one but turned it around the next week beating the Waratahs 39–17 in Gosford. The following week the Reds beat the competition leaders the Brumbies 20–19 after a penalty goal by Lloyd Johansson to qualify for the final in the ACT against the same team they beat. However, Queensland lost 42–17. Later in the year Queensland beat the Cherry Blossoms 29–22 in Japan. The 2007 Super 14 season saw the Queensland Reds finishing a poor season by winning the wooden spoon, they couldn't have started the competition any better when they beat 2006 Grand Finalists the Wellington Hurricanes in Round 1, after that win they would not taste victory again until Round 12. The season was summed up in the final round of the regular season where Queensland were defeated 92–3 by the Bulls. This defeat was by the largest margin in Super Rugby history, although the NSW Waratahs had 96 points scored against them in their loss to the Crusaders in 2002. The 2008 Super 14 season witnessed a mini-resurgence of the Qld Reds, with the youthful side playing exciting and enterprising rugby under new coach Phil Mooney, they gained revenge against the Bulls after the 2007 thrashing by beating them 40–8, in what was the highlight of the season for the Reds. The Reds continued to play exciting rugby for the rest of the season but lost close matches against the Crusaders, Blues, Chiefs and Waratahs, while the side finished 12th they showed plenty of promise and regained some respect. The 2010 Super 14 showed the real potential of a team that had been on the ropes for the last 6 years. After losing their star back Berrick Barnes to the Waratahs they unearthed the talent they had not noticed like that of Quade Cooper, Digby Ioane and Will Genia. They became the feel–good team of the year becoming the only team to beat both the year's finalists under the new coach, former Waratahs mentor Ewen McKenzie. The highlight of their year was their 19–12 victory over the Bulls in which they played out a fast game to beat a truly world class side. A late injury plague affected the last two games of the season and ultimately a finals spot. Although the Reds missed the finals, they showed good prospects for the 2011 Super Rugby season. In the debut season of the renamed and revamped Super Rugby competition, the Queensland Reds showed their improvement from the last few years. After several seasons of mediocrity, the Reds finished the regular season at the top of the table, with 13 wins and 3 losses. In the final, Queensland Reds achieved their first Super Rugby Championship in the professional era, beating the Crusaders (18–13) in front of a record crowd (52,113) at Suncorp Stadium, Brisbane. Following the win the Reds were handed the keys to the city after a ticker-tape parade through Brisbane. In January 2015, James Slipper was appointed captain of the Reds, taking over from James Horwill who had previously announced he would be leaving at the end of the Super Rugby season to join the Harlequins club in England. Karmichael Hunt and Rob Simmons were appointed as vice-captains. The teams' home strip traditionally was a maroon jumper with a white collar, navy shorts with maroon socks with white hoops. In more recent years the jumper has become more red in colour with the home playing strip now red jumper (no collar), red shorts and red socks. The jersey is manufactured by KooGa, and the primary shirt sponsor from 2011 St George Bank . Traditionally, the Reds Super Rugby logo as well as the traditional Q logo both appear on the jersey, however for 2007 a commemorative shield was worn instead, which incorporated the QRU's four logos over the past 100 years. The Super Rugby logo and sponsors Tooheys New appear on the sleeves. The alternative jersey is similar, except that it is predominantly white. The Reds' logo is a Koala, a native Australian animal, with Reds written underneath it. 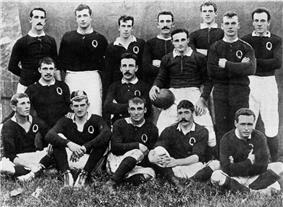 Prior to 1895 the Queensland team wore a variety of jerseys until the red/maroon colour became the Queensland jersey. In 2007, the Reds used a commemorative jersey in celebration of 125 years of Queensland rugby. This was accompanied by a new logo featuring four Queensland crests from the past. The 125-year crest featured four sectors; the Northern Rugby Union logo from 1882 (top left), the emblem from 1910 (top right), the 1935 logo (bottom left) and the current koala logo (bottom right). The Pilecki Medal is awarded to the best Reds player at the end of each season. The traditional home of Queensland Rugby is Ballymore, which was built in the late 1960s in Brisbane. Throughout the Super 12, the Reds played their home matches at the stadium. The stadium hosted a number of matches during the first ever Rugby World Cup in 1987, including a quarter final. Ballymore was set to host games at the 2003 Rugby World Cup as well, but due to ticket demand, all games were moved to Suncorp. 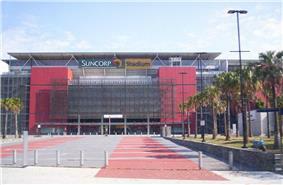 With the expansion of Super 12 to 14 for the 2006 season, the Reds made the move to the 52,500-seat Suncorp Stadium, the stadium has been described as an investment in the future of the Queensland Rugby with easier access and world class facilities. At the end of the 2006 season they took their last home game to Dairy Farmers Stadium in North Queensland, home of National Rugby League team the North Queensland Cowboys. However, during the Super Rugby off-season, the Reds play a number of friendlies out at Ballymore. In addition the Reds have played pre-season matches on the Gold Coast at Carrara Stadium. In January 2007, the Queensland Reds released a team anthem to be sung by the crowd during matches and after wins. The song was sung in the Queen Street Mall by members of the team including John Roe, Ben Tune, Peter Hynes and Berrick Barnes . The lyrics can be found on the Queensland Reds official website. The Reds also launched new marketing campaigns for 2007 (e.g. "Join the Revolution"/"The Red Army Needs You"); and the fans have since been referred to as "The Red Army". Major sponsor St George Bank sponsor a cheer squad at some games known as the St George Fan Bank. Queenslands most popular rivalries are obviously the other Australian teams in Super Rugby (Brumbies, Western Force, Waratahs and, from 2011, the Melbourne Rebels). However, the most famous of these is the interstate clash between the Queensland Reds and the New South Wales Waratahs. The match between these two sides usually draws the largest crowd for the Reds when they are hosting the match, which is sometimes (such as 2006), used as the first game of the season. The matches contested during the season are also for the Bob Templeton Cup, which is a trophy awarded to the winner of the Queensland/New South Wales match. Former Queensland captain John Eales, prior to the Queensland and New South Wales clash in 2001 quoted former Wallaby Mark Loane to sum up matches against New South Wales, "the most hard fought fights are fighting with your brother in the backyard". There have been over 270 matches between the two teams, with New South Wales well in the lead with over 170 wins, and Queensland over 80, with 12 drawn. Since the start of professional Super rugby in 1996, 17 matches have been played, Queensland winning nine, New South Wales seven, and one being drawn. The Queensland A team plays matches against interstate and international representative teams, and has also competed in tournaments such as the Pacific Rugby Cup. Known by various names over the years including Queensland A, Reds A, Reds College XV, and Reds Academy, the team is selected from the best emerging rugby talent in Queensland. The squad is a mix of Reds contracted players, extended training squad members, Queensland Under 20s, and selected Premier Rugby club players. The Queensland Under 20 team competes in the Australian Under 20 Rugby Championship and also plays occasional matches against other representative sides such as Pacific Rugby Cup teams. Prior to 2008, state colts teams at under 21 and under 19 age levels were fielded in national competitions and in the Trans-Tasman Trophy, but these teams have since been consolidated as under 20s. EDS denotes members of the Elite Development Squad that was selected for a matchday squad. ST denotes players not initially included in the named squad, but subsequently signed on a short-term deal. Players with 100 or more caps. (2013) Match against touring British & Irish Lions. ^ Cordingley was captain in 2008 for 9 matches (rounds 5–14). ^ Barnes was captain in 2009 for 5 matches (rounds 1–5). ^ Genia was captain in 2010 for 12 matches (rounds 3–14). ^ "Rugby in the Colony of Queensland". Archived from the original on August 26, 2011. ^ "History of Queensland Rugby". ^ O'Loan, James (17 July 2011). "Ticker-tape parade for victorious Queensland Reds". The Courier-Mail. Retrieved 16 January 2015. ^ Newman, Beth (16 January 2015). "Slipper to lead Queensland Reds". The Canberra Times (Fairfax). Retrieved 16 January 2015. ^ "NSW and Queensland Jersey Colours". Queensland Rugby Union. Retrieved 14 September 2006. ^ "Reds unveil commemorative badge". Scrum.com. Retrieved 22 December 2006. ^ "Croft claims Pilecki Medal as best Red". Nine MSN. 11 July 2008. Archived from the original on 24 July 2008. Retrieved 4 May 2015. ^ "Brisbane WC games moved". www.colonialRugby.com.au. Retrieved 13 September 2006. ^ a b "Waratahs v Reds preview". www.rugby.com.au. Retrieved 13 September 2006. ^ "Reds College XV target undefeated 2013 campaign against Japan A". Reds Rugby. 18 March 2014. ^ "Annual Report 2006" (PDF 3.2 MB). Queensland Rugby. 2006. p. 24. Archived (PDF) from the original on 2 May 2014. Retrieved 6 May 2014. ^ "Annual Report 2002" (PDF 3.5 MB). Queensland Rugby. 2002. pp. 3, 28. Archived (PDF) from the original on 24 February 2014. Retrieved 25 March 2014. ^ "Queensland's football teams are locked in a battle for crowds". Courier Mail. 11 February 2012. Retrieved 24 February 2014. ^ "Queensland Reds 2012 Annual Report" (PDF). Queensland Reds. Retrieved 24 February 2014. ^ a b "Queensland Reds eclipse Brisbane Broncos as Queensland's No.1 crowd pullers for first time". Fox Sports. 13 September 2012. Retrieved 24 February 2014. ^ a b "Queensland Rugby Union celebrates 130-year anniversary". Queensland Reds. 2 November 2013. Retrieved 24 February 2014. ^ "St George Queensland Reds 2015 Squad Announced" (Press release). Queensland Reds. 29 August 2014. Retrieved 29 August 2014. ^ "Eight Queensland NRC players rewarded with Reds Elite Development contracts". Reds. 31 October 2014. Retrieved 31 October 2014. ^ "South African-born lock Marco Kotze joins St.George Queendsland Reds Elite Development Squad" (Press release). Reds. 30 November 2014. Retrieved 30 November 2014.